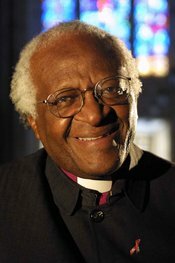 Desmond Tutu, Archbishop and Nobel Peace prize winner (1984). Desmond Tutu was born in 1931 in a small mining town in Transvaal. He studied to be a teacher like his father but due to the segregated nature of South African education, Tutu was encouraged to enter the church. 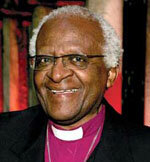 After a period of training in England Desmond Tutu was appointed the first black Archbishop of Johannesburg in 1975. Desmond Tutu became one of South Africa’s most outspoken critics of apartheid. He said he was motivated by religious teachings rather than a desire to enter into politics but his strong views clashed with the apartheid State. He says he was influenced in his views by many white clergymen in the country, who were also strong opponents of apartheid such as Bishop Trevor Huddleston. The Archbishop consistently told the South African government that apartheid was contrary to the will of God and was doomed to failure. However as well as being a strong critic of apartheid Desmond Tutu has also stressed the need for reconciliation and forgiveness between the different parties associated with apartheid. Desmond Tutu is an international figure of high regard. He often speaks out on behalf of oppressed groups around the world. He has been a noted supporter of the Palestinian cause, and the people of East Timor. Recently he has been an outspoken critic of the mistreatment of prisoners at Guantanamo Bay and the dictatorship of Robert Mugabe in Zimbabwe. Desmond Tutu Peace Centre =Aimed at expanding the legacy ofArchbishop Desmond Tutu.